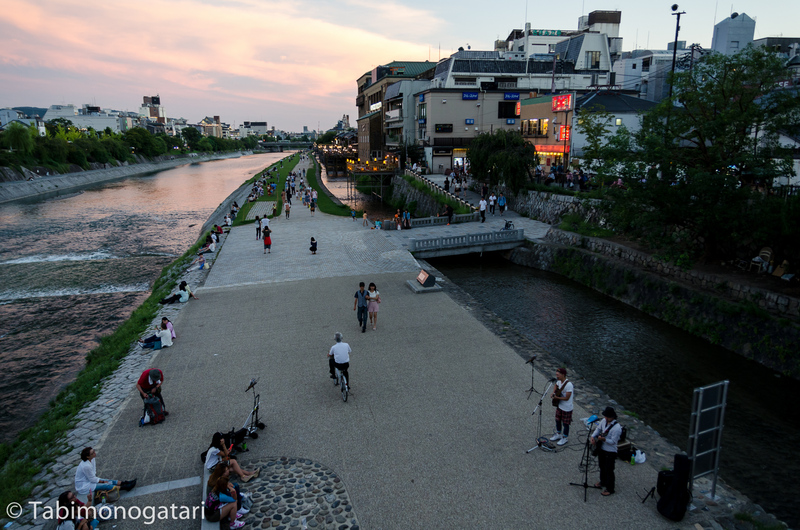 While my original plan was to visit Kyoto last weekend, because of a sudden change of plans I went to Osaka instead. Looking back, it was a good idea to do so since I could meet new and old friends. 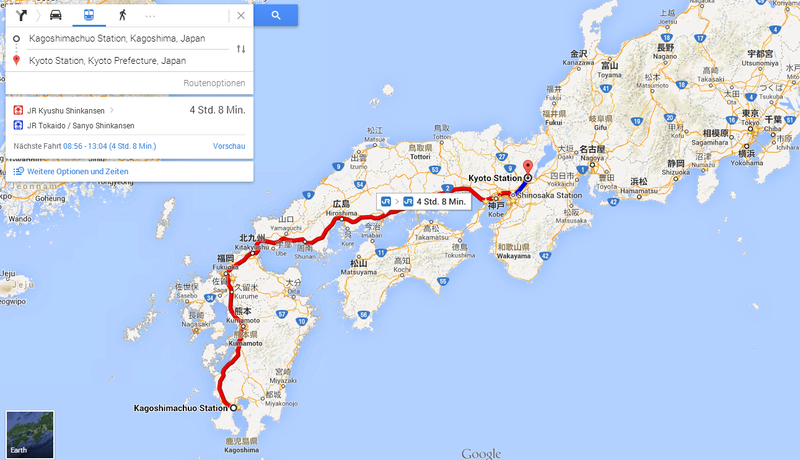 Good that the original plan also included a second day for the old capital the week after Kyushu on my way northbound. After boarding the Sakura Shinkansen at nine o’clock I arrived in Osaka around one p.m., not a bad time for covering approximately 850 km. 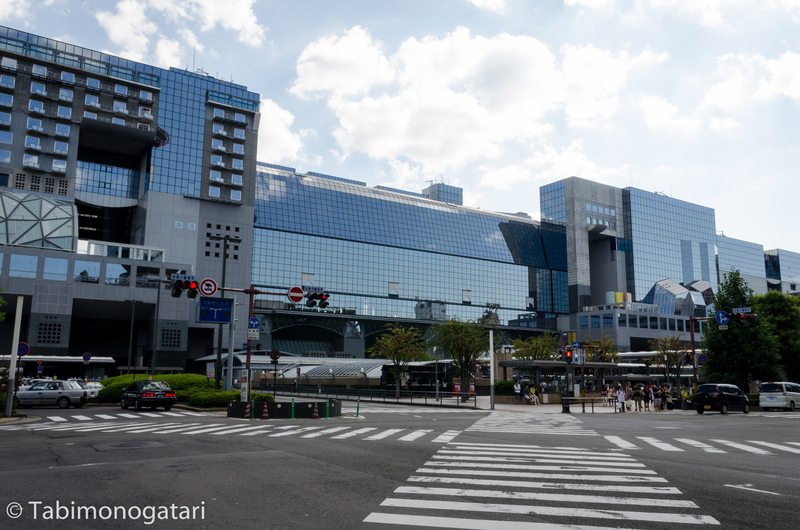 After transferring it was just one more station with the Hikari until Kyoto station. After directly comparing the two trains with each other (Kyushu Shinkansen Sakura vs. Tokaido Shinkansen Hikari) I can clearly recommend former over latter. The Shinkansen travelling the West of Japan have wider, more comfortable seats with two times two in a row. If you have a rail pass, try to catch the Sakura if you travel to Hiroshima, Fukuoka or Kagoshima from Osaka. Since it was time for having lunch again and being hungry I wanted to buy a bento box at Osaka while transferring. In the end I decided against it and tried a freshly prepared fruit smoothie before heading on, postponing lunch until Kyoto. This trip is clearly none designed after a travel guide. The composition and the destinations were chosen for my individual needs, so I would not recommend following my route if you come to Japan for the first time. My aim for this trip was to visit both new and already visited places all over the country in the short time frame I could afford. The result was a tight schedule with one day stays almost the whole time. Doing so I might have missed many details about the places I visited, you could say I chose quantity over quality. But I have a reasoning, though it is highly subjective. This trip is more like a journey than a vacation for me. Coming back to Japan after two years of my new life as a student in Switzerland I wanted to have some alternation. In the recent years I noticed more and more that I like to combine travelling, photographing and reporting about it, at best directly on site. Also, I am more of the restless type. It is more interesting for me to be always on the move, instead of staying at a place for a longer time. There is another reason I signed up for this far-distance short-stay travel plan. Anticipating that I will come back again and again in the mid- to long-term I wanted to get an overview about many different places all over Japan. Knowing where I enjoy the time the most will help me planning my future trips even better. Last time I spent two full days in Kyoto, visiting the cultural sites for the most time. This year there were a few places I wanted to visit again, but only that much. Please do not get shocked when you arrive in Kyoto for the first time. While everyone talks about shrines, religions, craftmanship and cherry blossoms you may not forget that Kyoto is a metropolis after all. When you exit the modern building you will not stand in front of an alley with traditional houses with sakura cherry blossom trees blooming here and there. 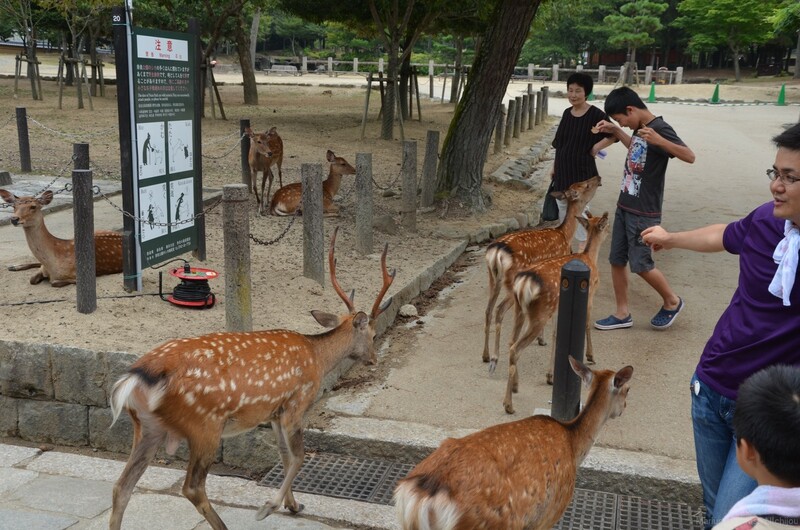 Instead, you will see traffic jams and endless crowds of visitors with only few locals mixed in. 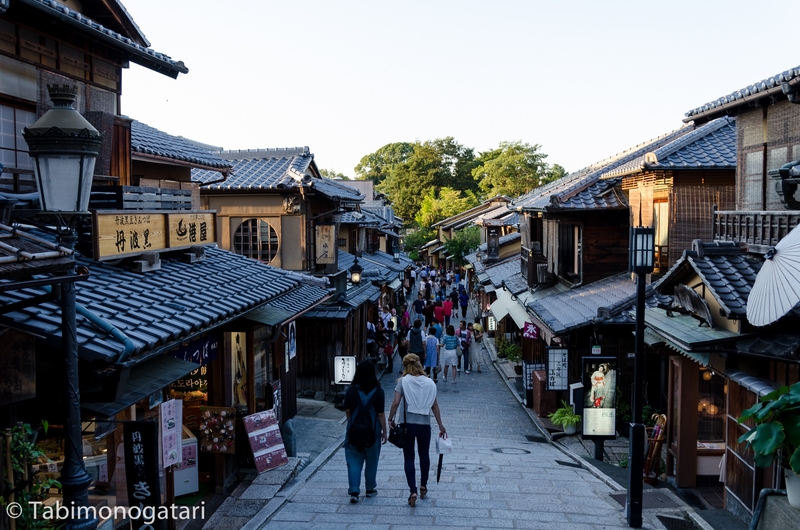 If you are looking for something more like the former, take a short train ride to Nara or Uji, not very far from Kyoto. 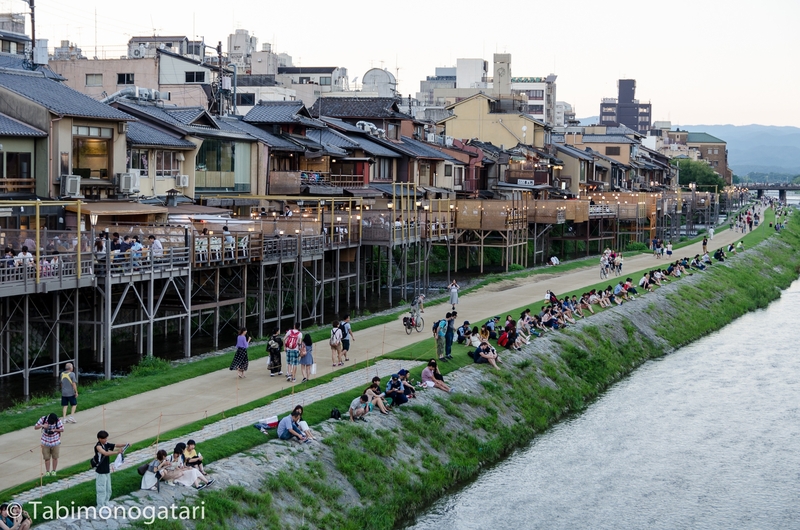 After you have recovered from the pessimistic passage let’s enjoy Kyoto, in my very personal way. Thanks for bearing with me so far. 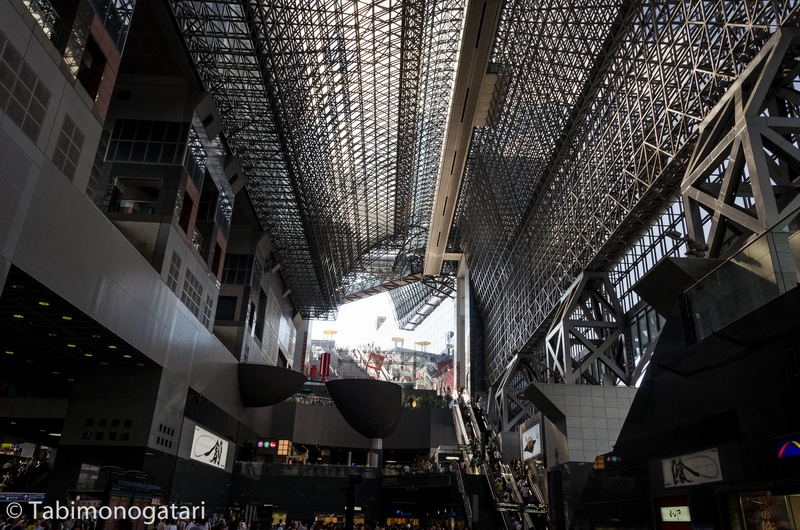 Arriving in Kyoto, the station was busy as usual. After passing the gates I left the station from the main gate when I noticed a fashion show going on just in front of it. Just when I wanted to leave I saw multiple couples in wedding outfits hurrying over the plaza. 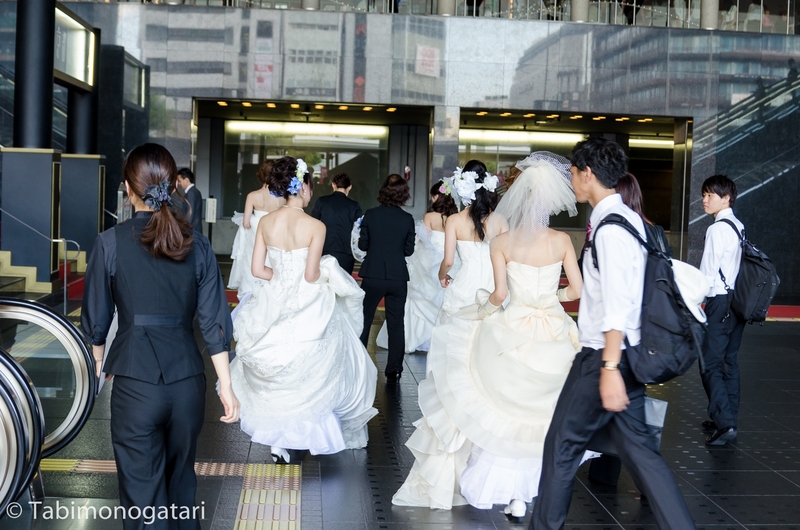 You might think that was cosplay, but no, the Japanese find a particular interest in doing Western style (Christian) weddings, combining it with various activities. Right in front of the station are various bus stops with busses departing every few minutes. The bus system in Kyoto (no streetcar yay) is both very useful and hard to use. It wholly depends on whether you understand which line to take to get to the next place. Kyoto is very well prepared for foreign non-Japanese speaking visitors. Once you understand (or read about) the basic rules it is not hard at all to get from A to B. There is no loss of maps and asking somebody might save a lot of time. 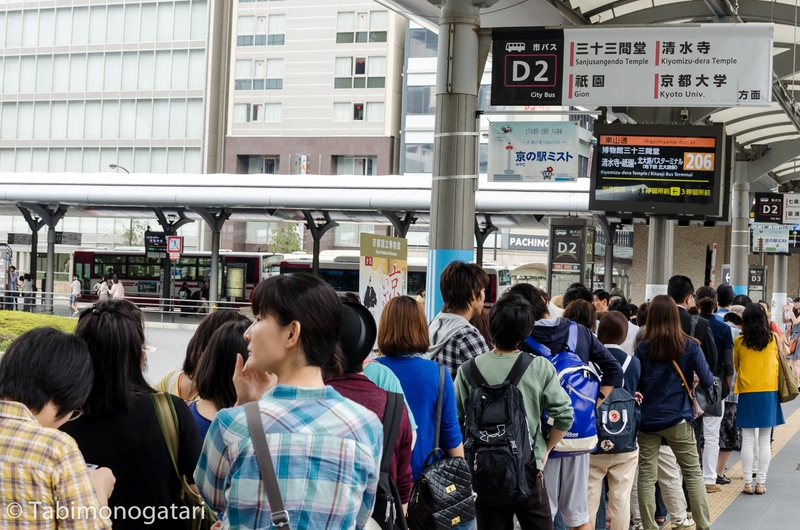 Everyone recommends to buy a day pass at the bus ticket counter for 500 Yen and use only buses from there on. I totally agree with this advice, too. While there are several other ways of transportation, none are as cheap and give access to all sites of interest. Still, I bought no ticket since I would not use the bus that much. 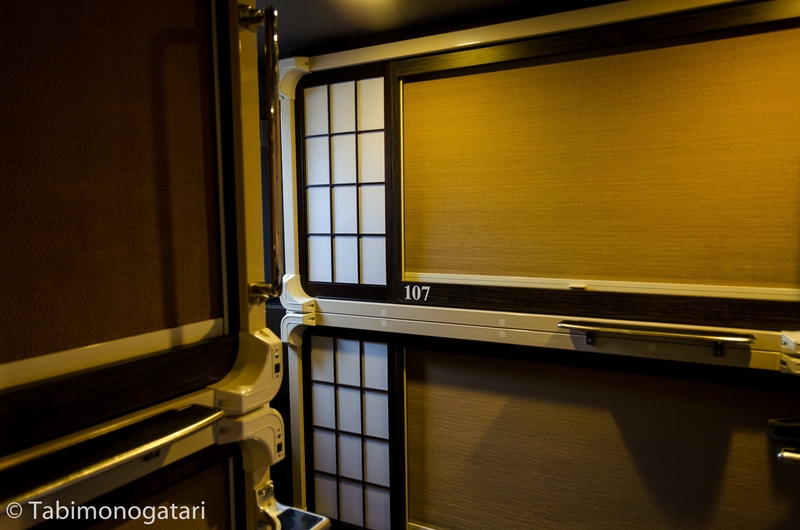 While researching, I found about a special kind of Capsule Hotel close to the station. The premise with these kinds of accommodations is usually the following: When it gets late and the last train departed without you these “hotels” offer a small tube like sleeping place. While the comfort is not luxurious on first sight the little things make it a bit better. It is possible to arrive at almost every time of the day and night, a shower and hygiene articles are provided for every guest. It is one of the typical Japanese things to try, besides having not the best reputation. The place I found calls itself Capsule Ryokan. There, the sleeping space is not much of a tube, but a cosy sleeping place, the paper wall reminded me of a traditional inn. 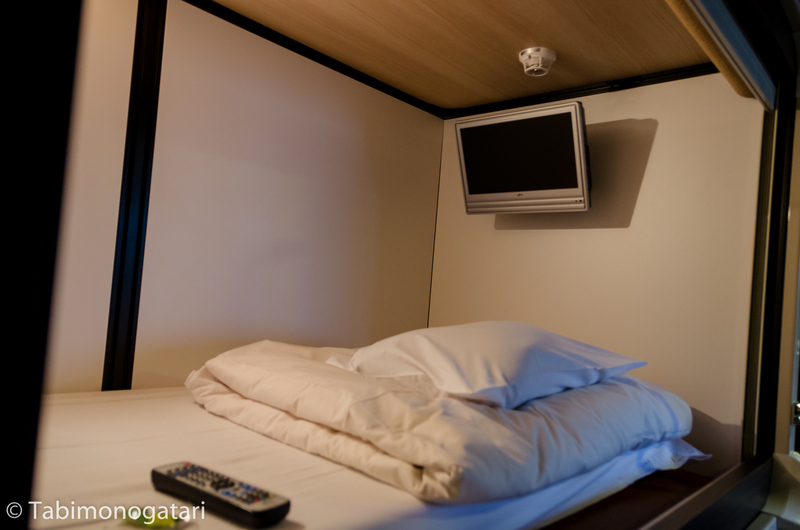 Like every capsule hotel the space just fits the bed itself, but a locker was provided and every sleeping space houses a small television and an alarm. The rent was 3500 Yen, the staff was very nice and helpful so I might go there again. Just around the corner was another typical Japanese restaurant. 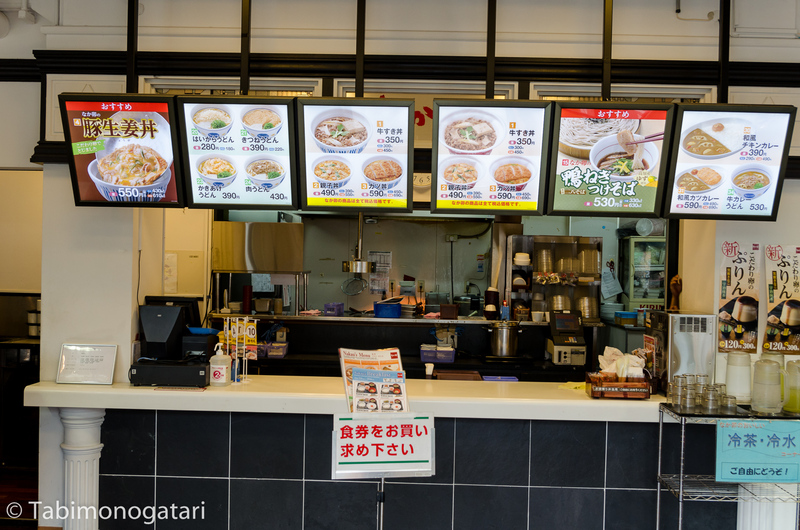 Like the chain Yoshinoya, these kind of restaurants offer cheap meals for busy people. At the entrance you will find a vending machine where you order and pay. The menu is usually Japanese only, but with Hiragana knowledge and the pictures of the meals displayed there is not much what can go wrong. Afterwards just hand over the coupons and wait until you can pick up your meal. Lunch sets are a great way to save money and a good meal at the same time. The price for all of this was just 600 Yen! It really gets late much too early. 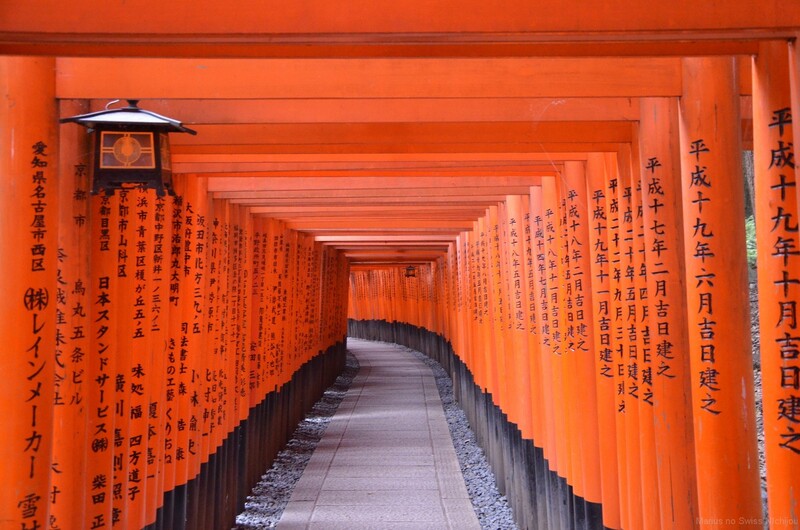 One thing I definitely wanted to visit again was the Fushimi Inari Shrine just outside Kyoto’s center. Use your Japan Rail Pass or pay electronically with a SUICA IC Card, board the Nara line and get off after two stops at Inari station. 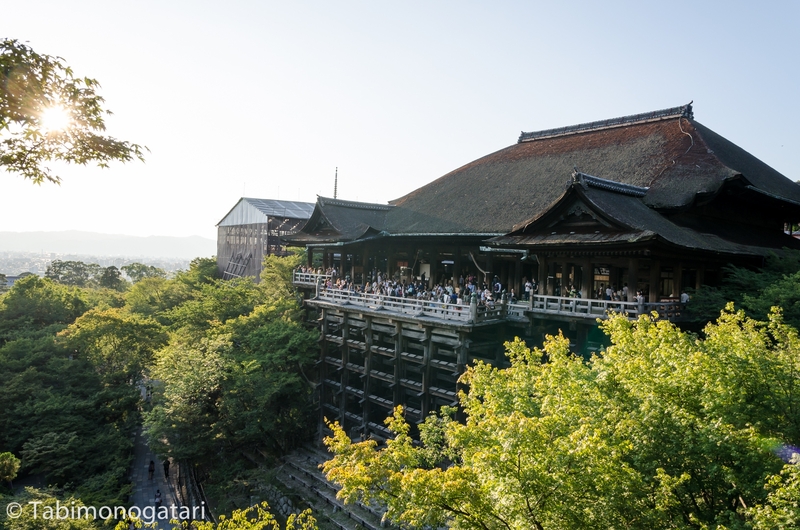 Besides Kiyomizu-dera it is one of my favourite places to visit in Kyoto and I am not alone with that opinion. 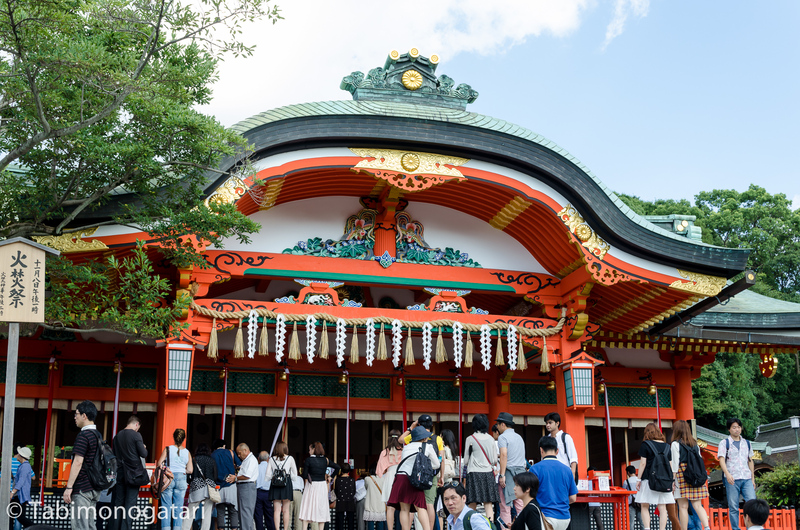 The shrine area begins just at the opposite side of the station and is crowded by countless visitors most of the time. If you want to be more on your own, consider coming early in the morning when the sun will rise behind your back. Kyoto is always full of tourists, but I enjoyed coming here on Sunday. On first thought it is a bad choice, but since in Japan the stores are not closed on Sunday (more likely on Monday) this poses no issue. 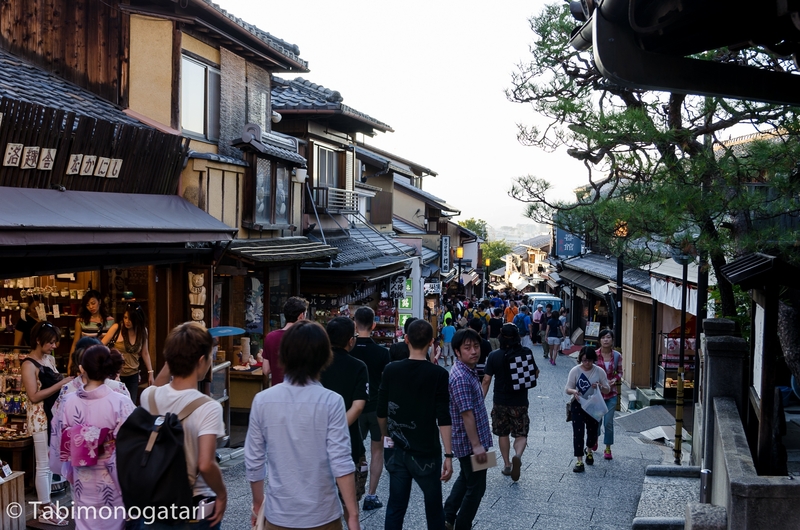 Since foreign visitors will come without preferring a specific weekday I prefer it when there are more Japanese people on the streets on the weekend that Kyoto does not appear to be entirely inhabited by foreigners. 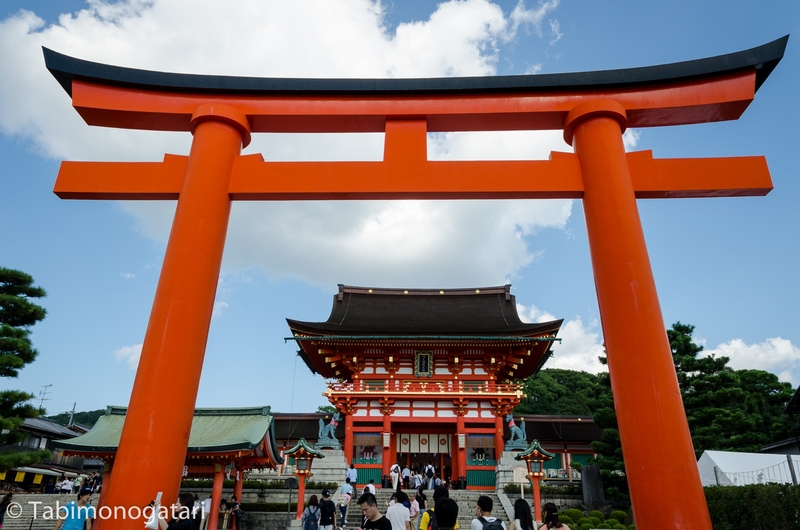 The very popular shrine invites with a big Torii followed many bright red painted shrines. Make sure to buy a lucky charm for your or a close person’s safety, luck in love or success in business. After stocking up with a bottle of cold tea I began my ascend to the mountain. At Inari shrines the fox gods are worshipped. 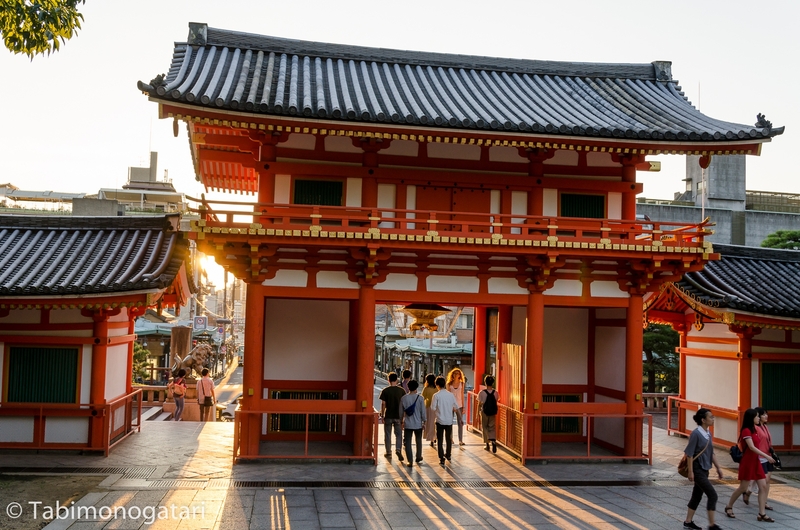 Typically these shrines have many red Torii arcs and fox statues made of stone. The Fushimi in Kyoto is so famous not for the shrine itself but for its Torii. Ascending the trail up to the mountain you will pass thousand Torii all uniquely inscribed. It is really hard to get a decent picture of the arcs without people passing through. Nowadays everyone just makes photos of themselves. The trail is quite long and with the hot sun shining down on us many decided to return after a short walk, so did I. 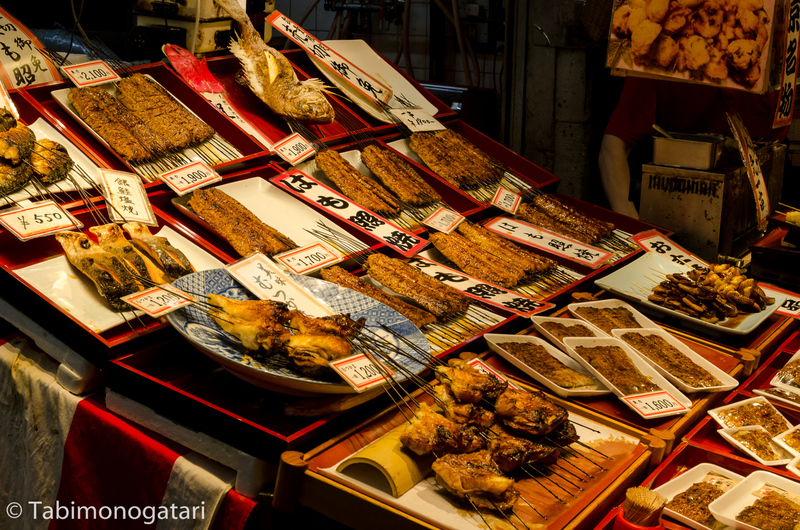 In the vicinity of the shrine are many stalls and shops offering local dishes, souvenirs and crafts. Try some green Matcha flavoured sweets at least once. I am a big fan of it since long trying many of the offered sweets. My recommendation is Matcha filled Taiyaki (fish formed cakes with a filling) and Uji Matcha Kitkat. 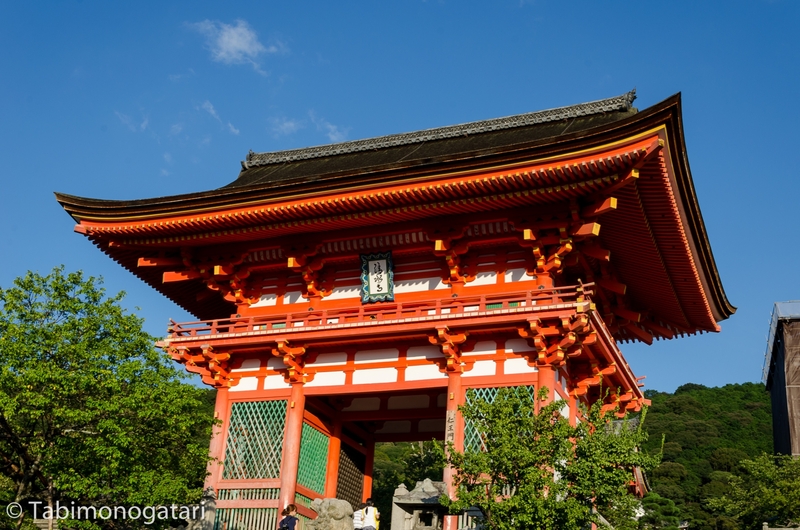 In the late afternoon I took a bus to visit Kiyomizu-dera, another famous temple in Kyoto. The temple is accessible from a ten minute walk up the Eastern hill from the closest bus stop. 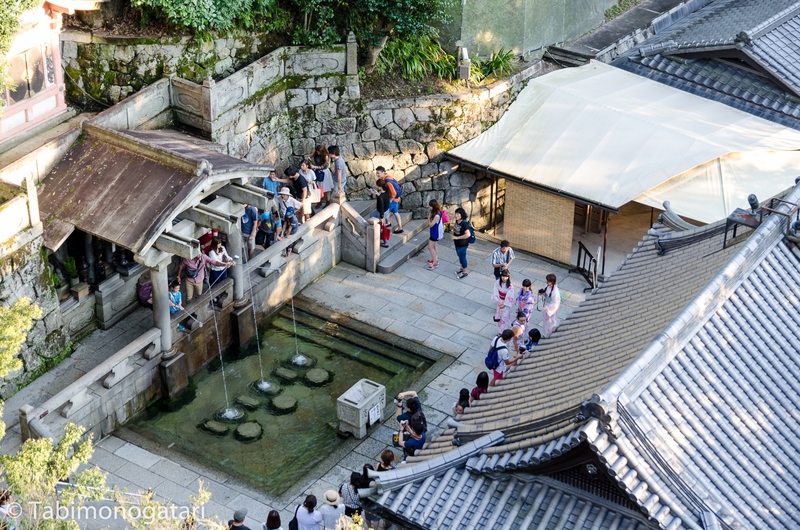 After paying an entrance fee of 300 Yen you can visit the terrace built over a cliff and make photos with Kyoto’s cityscape in the background. The name of the temple contains “water” and that for a reason (not the one I will mention). There is a spring where you can drink a sip of its water which is believed to help you stay young and healthy. Like last time, the queue was endless, so I skipped it again. Eating natto every day is more healthy anyway. Heading North I passed narrow streets with well preserved houses. Many now house a shop where you can shop to your heart’s content. After walking a bit further Yasaka shrine came into view. The sun started to set and I managed to make a photo of the illuminated gate. Passing the river flowing from North to South I entered the Gion district. The riverside invites for strolling and slowing down. There are many restaurants with a terrace on which you can eat exquisite cuisine with a view over the river promenade. 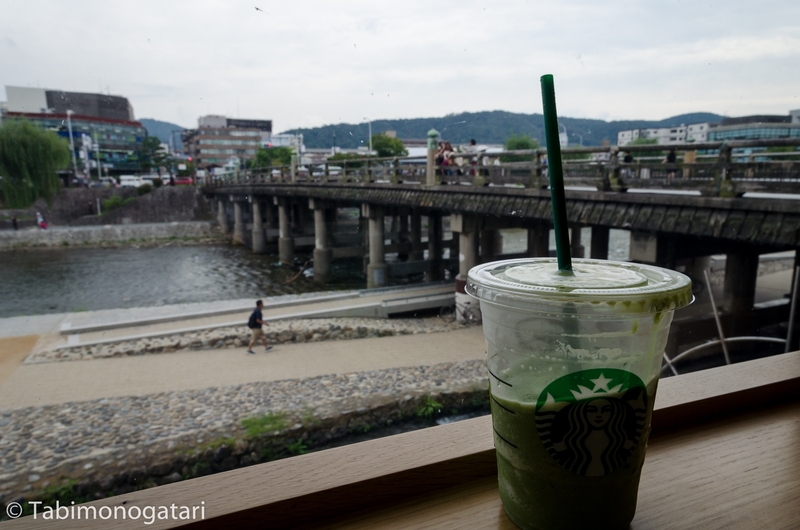 For those who do not want to pass on this one besides being on a budget can try the Starbucks branch located at the Sanjo bridge, a few minutes to the North. In many smaller streets you will find whole alleys of restaurants with waiters recommending to come in (not at all as annoying as in Paris). 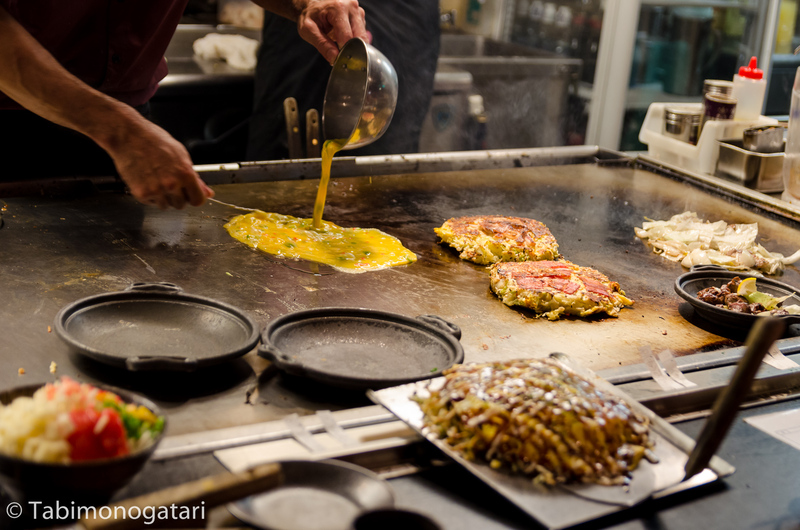 A bit further away from the busy streets the menu of an Okonomiyaki themed restaurant convinced me to stay. 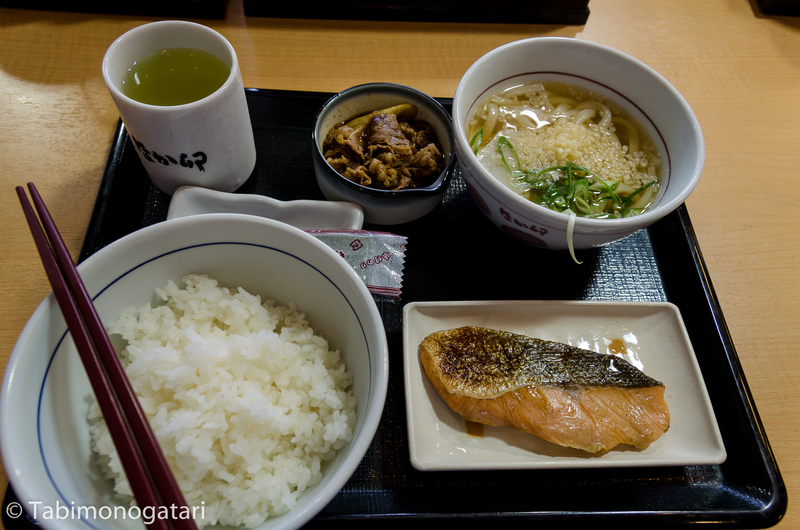 The price was good (1200 Yen with a beer) and I could eat from my own hot plate at the counter. The menu offered all kind of variations and related dishes like Hiroshima style and Yakisoba, but I went with the classic Osaka style with pork this time. 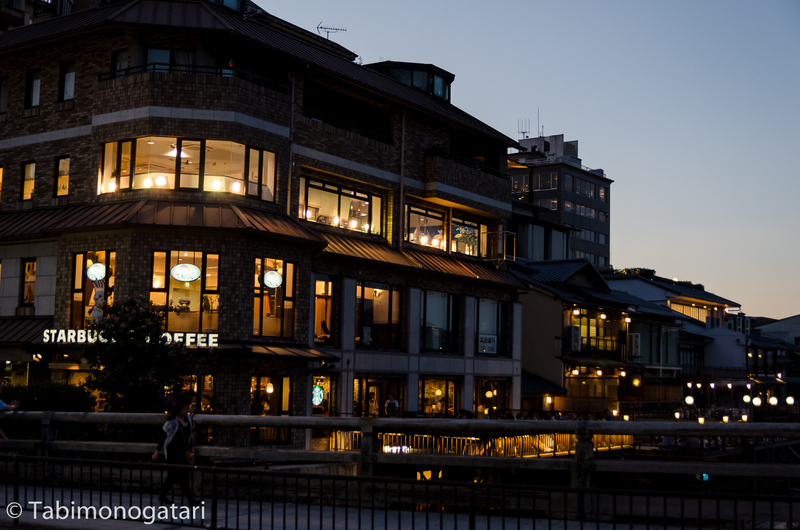 After dinner I walked around the Gion district and then finally headed home. A Meiko (apprentice Geisha) passed by once, but in a hurry so I did not try to bother her. I had the feeling nowadays there are too many people making them feel uncomfortable as she was hurrying without looking up to anyone face. Still being hungry I visited a hybrid store between conbini and supermarket (24h open but distinct groceries section) and picked up a snack. Back in the capsule hotel I made a few arrangements before catching some sleep. Maybe I was a bit too enthusiastic about the design of the rooms. The place reminded me of a crossing between a capsule hotel and a hostel dormitory. While there were around eight capsules in the same room I did sleep well as the bed was comfortable and nobody was noisy. For breakfast I went to the same place from yesterday’s lunch. Again, the whole set was 400 Yen. Aiming for a train at noon I bought some extra time in Kyoto. Going to Sanjo again I visited the riverside and bought a cold beverage at the Starbucks branch. 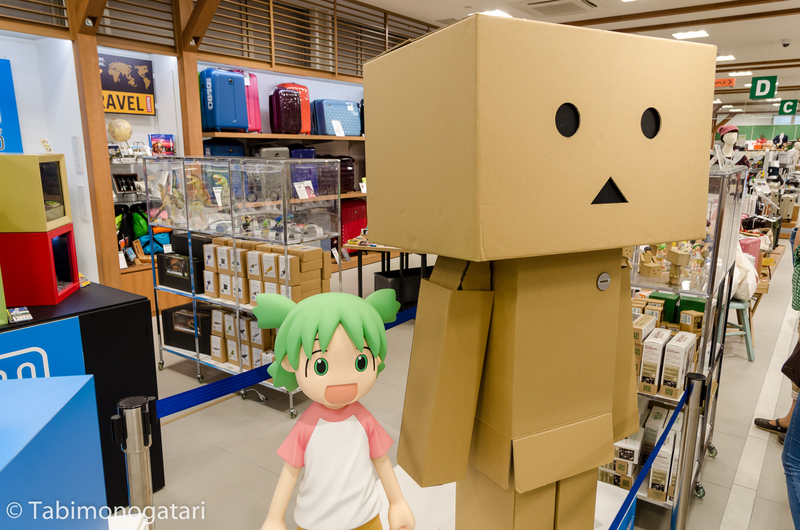 Some blocks to the West begins an arcade which also includes Nishiki Market, the biggest local market for consumers. Being in a narrow street there is not much time to stand still long. 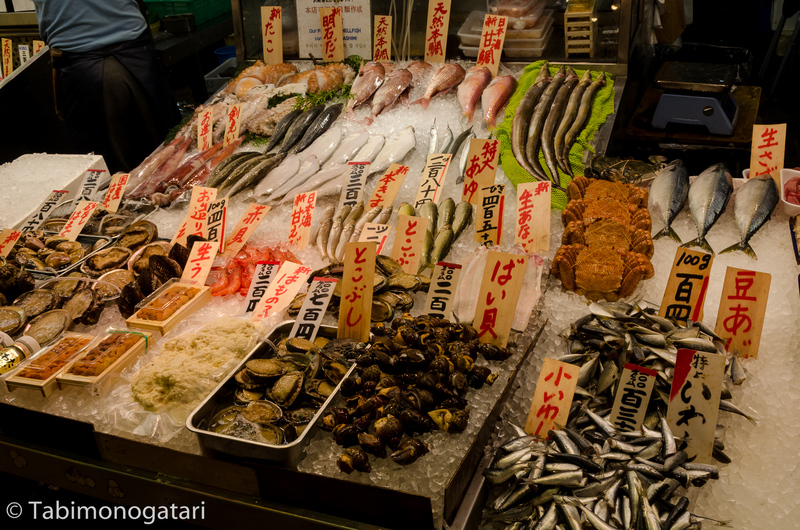 This market does not put its focus on seafood, offering many other local produce, sweets and handcrafts. Before picking up my luggage I could not resist to visit Tokyu Hands and bought some small things for my kitchen. It is hard to leave without a bag full of things. With an eki bento I left Kyoto from track 0. Unfortunately, I did not arrive in Hogwarts, but at least arrived in Kanazawa on time.